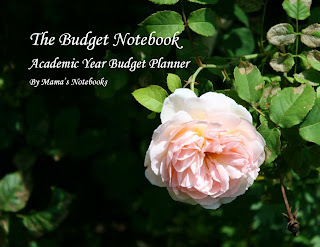 Hello, and welcome to Mama's Notebooks! 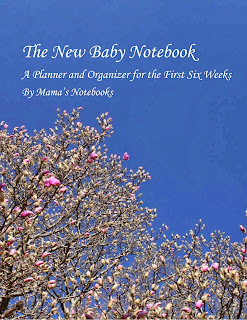 Mama's Notebooks brings you helpful notebooks to organize your family life. 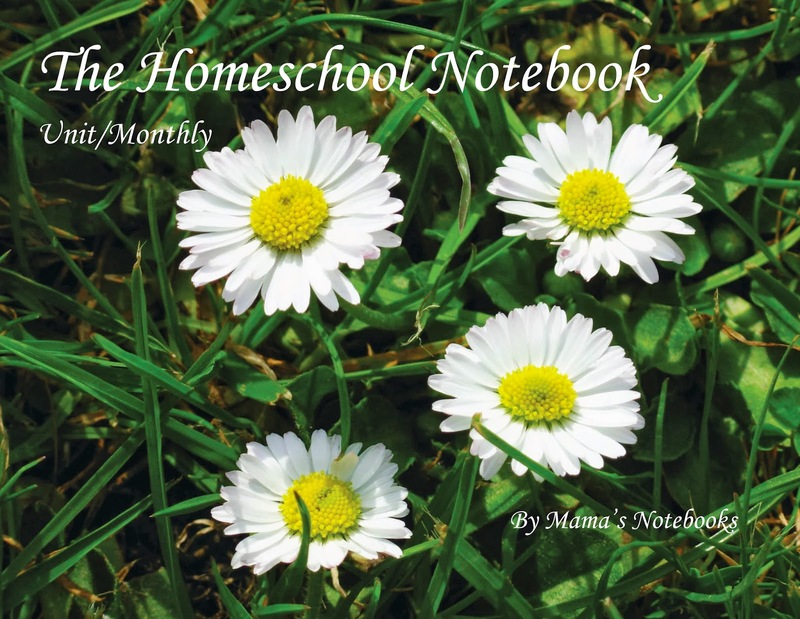 All of our notebooks are designed from the ground up by a Mom for other Moms, and feature simple and effective charts, lists, and ideas to help your family life run more smoothly! Our notebooks are spiral bound for your convenience. Above are tabs for our our product pages or you can click on one of the pictures below.Our books are sold through Lulu at our Webstore. Have a look around and make sure to sign up for our email list and connect on our social networking sites! 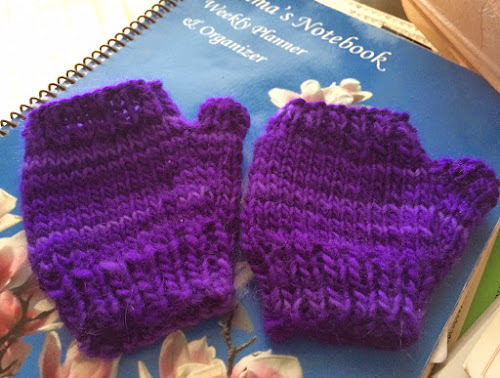 I finished a little headband/hand warmer gift set for an early spring birthday. I'm hoping it's just enough to keep the chill out. 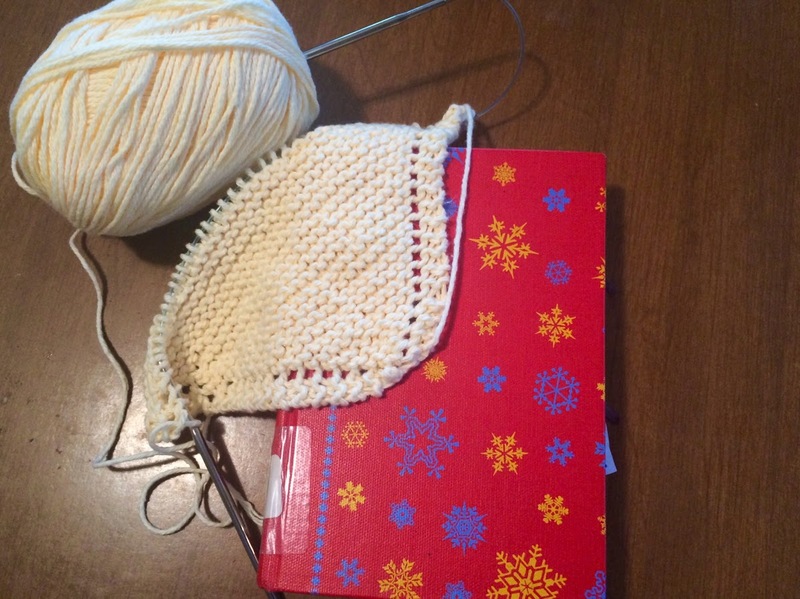 Both were fun knits. They are the same yarn but I can't seem to get the camera to show that. Purples are tricky! 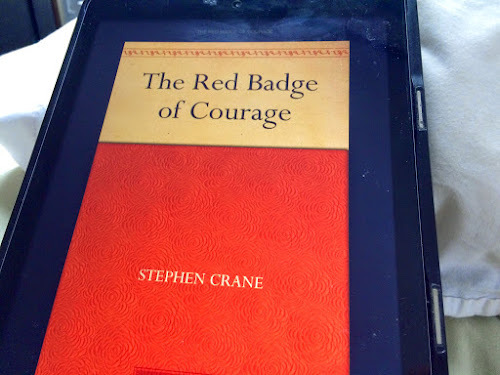 I read the Red Badge of Courage. It has been on my list for a while. It is very well written book about a character that I did not find endearing. It was really strange to see the civil war from inside of a soldier's head. It all seemed so messy and confusing, but then again, I really don't understand the inner workings of war. I found it fascinating tough, and I am glad that I read it. I will be sharing this at Small Things and Frontier Dreams. 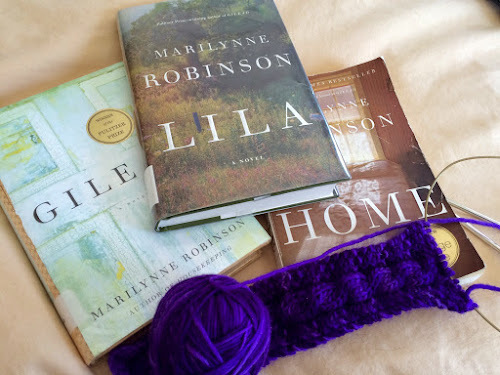 Since my last Yarn along, I have read Marilynne Robinson's trilogy. I probably wouldn't have picked it up on my own but my book club wanted to read Lila and I was curious about the other two. I think that Lila is by far the best book in the trilogy. It is the most compelling and about a fascinating life and mind. It's about restlessness, purity of mind and heart against all odds, longing, and dealing with a crazy, nomadic, poverty stricken life after getting out of it. I honestly had a lot of trouble reading Gilead. It is like walking around in someone else's fuzzy brain. The main character seems to be some kind of liberal Calvinist who, dispite his old age, hasn't come to very many conclusions about life. His theological perspective confuses me beause it is just so unclear. The best parts of the book are when he talks about his childhood, his grandfather, and Lila. He's a good character, I even like him, but I didn't want to walk around in his mind with him. Home was the second best book in the trilogy. It's about two siblings out of a family of eight children that have hit middle age and kind of "failed" at life. They both return home with their dying father and form a friendship of sorts. While it was an interesting read, I found the repeated unclear life perspective in it to be a bit depressing. There's a lot of groping in the dark and coming up with nothing. Pluse, there weren't really any conclusions at the end which I found unsatisfying. But maybe it was that way on purpose? I think that Lila was worth the read, but I wouldn't recommend the other two. There was just too much muddled thought in them. I'm knitting a little gift out of purple yarn. It's a beautiful variegated lamb's pride and I had trouble capturing the colorway in the photos. The lighter bits don't show well. I just love the pattern that I'm using. It's simple but pretty and I think that the design for the ends is going to work really well. Perfect for early spring! 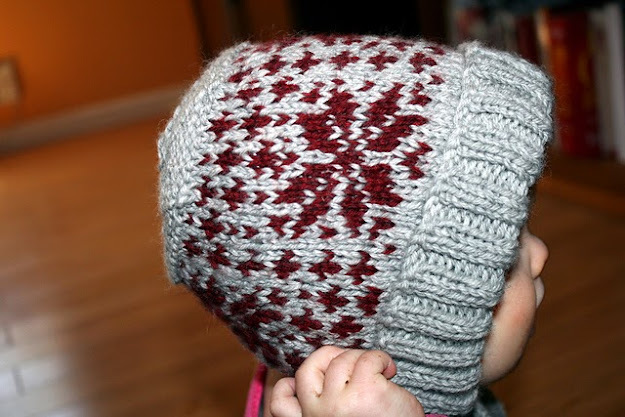 I also published a free pattern this week (picture below). 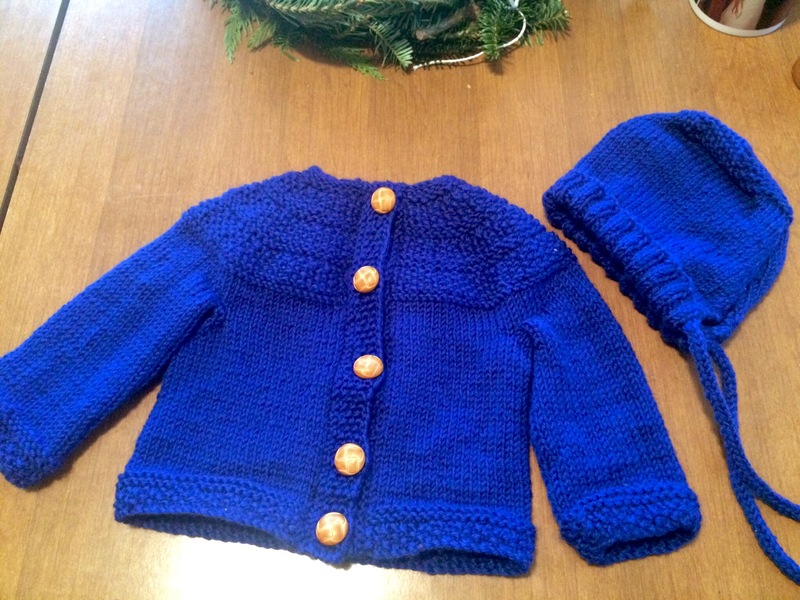 It's a staple garment for all of my children from 0-4 years old and I make it as a gift for a lot of friends. 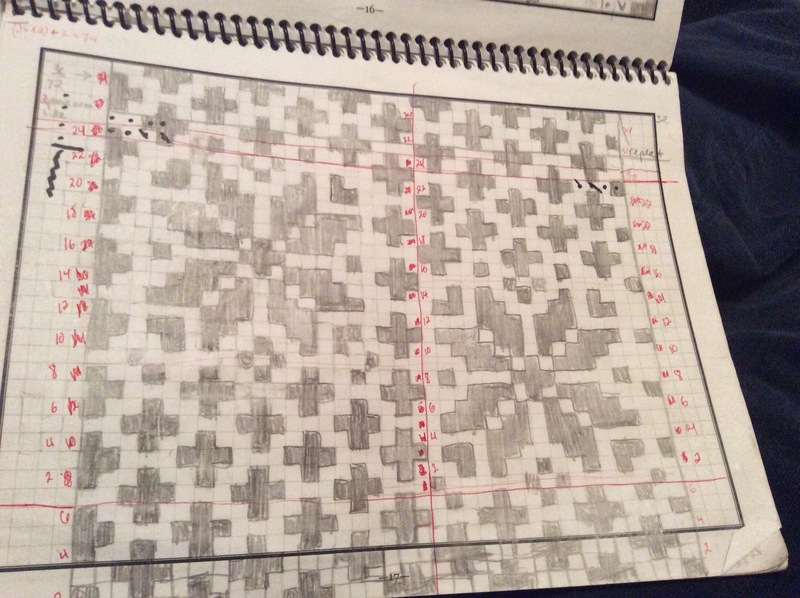 I love blank slate patterns like this one because the possibilities for fun modifications are endless. Fair Isle, cables, lace, oh my! 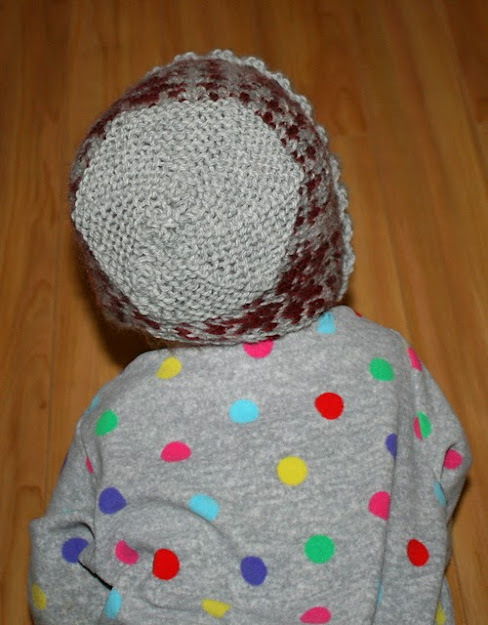 I absolutely adore this simple bonnet for babies, toddlers, and preschoolers. They are warm and cute. They knit up very quickly in stockinette but can be jazzed up with lace, cables, or Fair Isle. Below is the pattern for a stockinette bonnet. 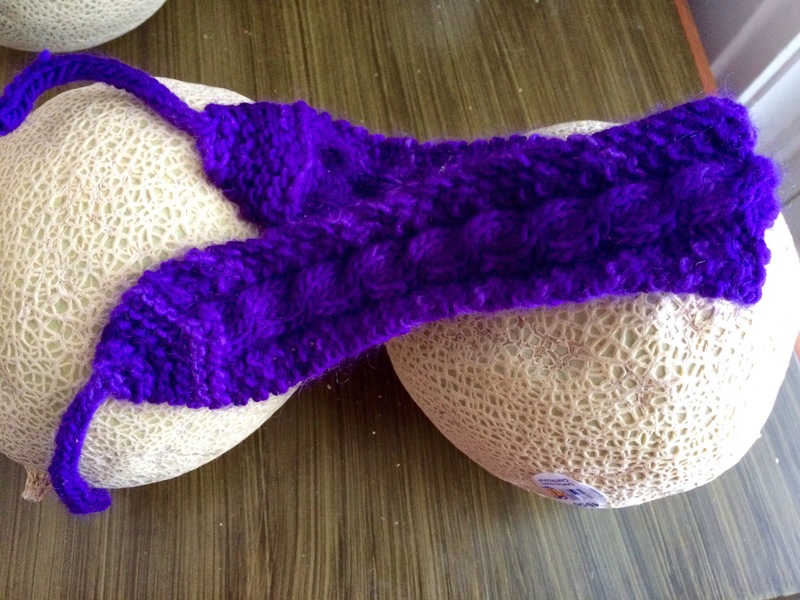 Here is the ravelry entry for the pattern. 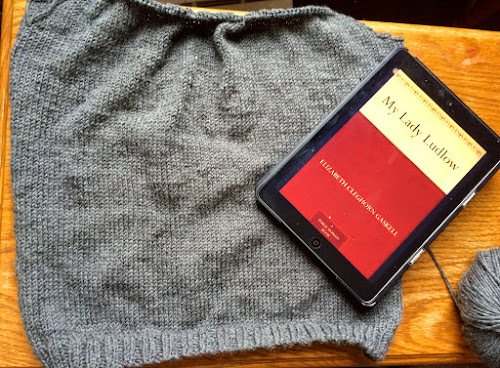 Switch to stockinette stitch. 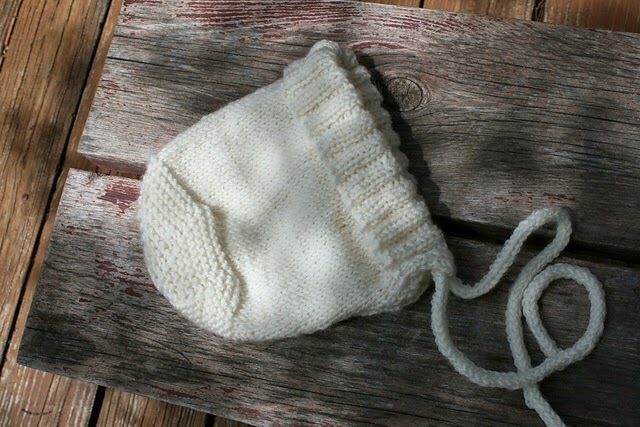 At the same time, decrease 10 (12,14,16,18) sts evenly over the course of the first stockinette row. You will have 70 (76, 82, 88, 94) sts. You will have 62 (68, 74, 80, 86) sts remaining. Insert 6 markers: the first after the first stitch, and the next five after 10 (11, 12, 13, 14) sts. There will be 11 (12, 13, 14, 15) sts after the sixth marker. 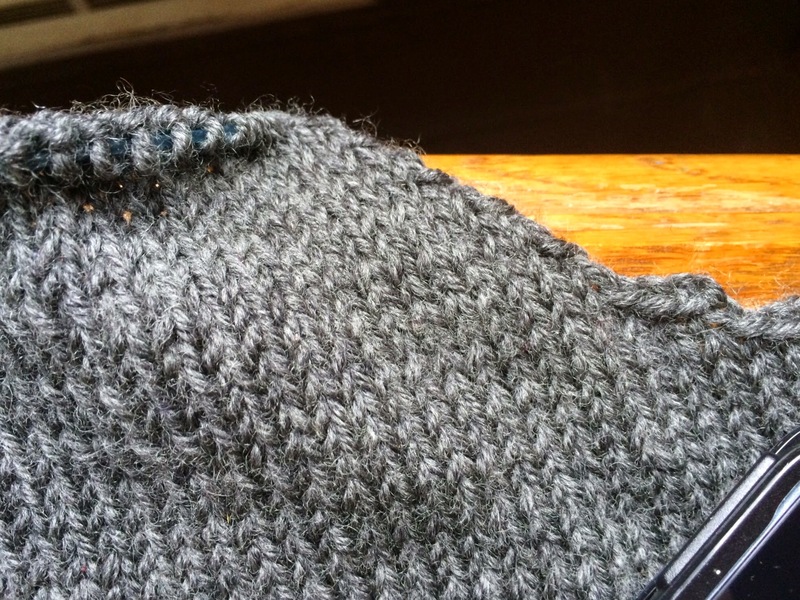 Continue in garter stitch, simultaneously decreasing after each marker (K2tog) on every RS row until 10 sts remain. K2tog across the next row. Cut the thread, pull it through the remaining stitches and use it to sew together the back of the bonnet, including the 4 BO stitches on each side. I recommend doing this before making the I-cords. Fold ribbed section over on itself and sew one set of edges together. Then sew loosely across the fold with the running stitch. 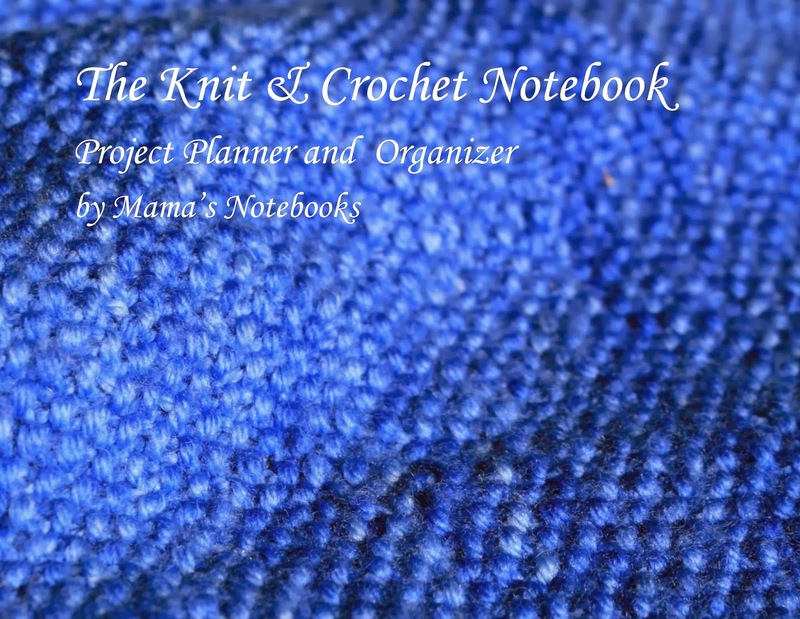 Keep the stitches that will show in the purl sections of the rib. Sew the other set of edges together and tie in loose end. Pick up three stitches from the front corner of the folded over onto a double pointed needle. I recommend picking up the stitches through both layers of the fold over. 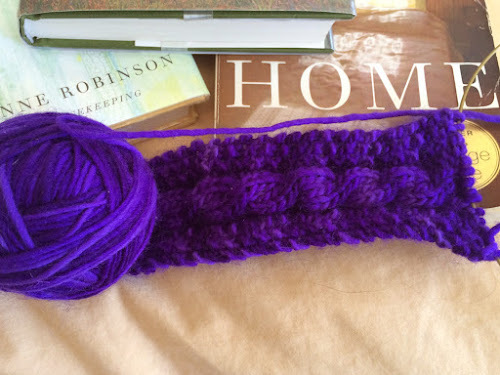 Knit an I-cord for 8" or desired length. Tie off and weave the loose end back up into the cord. I-Cord instructions can be found here. Weave in all other loose ends and you're done! We are in the midst of packing so there hasn't been a lot of knitting or reading going on here, but there has been some! 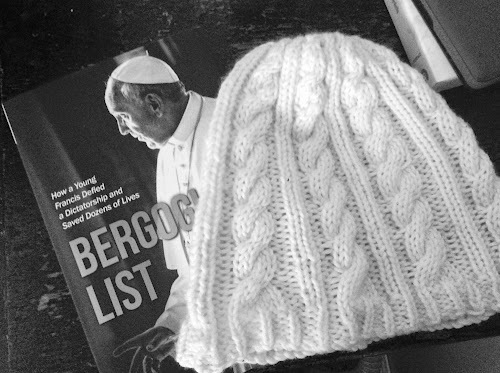 I am currently reading Bergoglio's List. It is about how Pope Francis saved people from torture and death during the the Argentine "time of sequestration," when a military dictatorship terrorized its people. This book is a very personal read for me, and not just because I am Catholic and love the Holy Father. When I was in college, I spent a summer in Argentina working in a very poor and dangerous neighborhood. It was a time of immense personal and spiritual growth for me. I lived with a family, worked with children, and learned about the country's history and the people's identity. In Argentina I found my heart and I loved every joyful, painful, challenging moment of it. Learning about the country's history necessarily meant learning about the time of sequestration. A generation was nearly wiped out. People disappeared in droves. There was no justice, citizens were treated like animals and most could not escape it. The mothers of the dead still circle the center Buenos Aires in protest. I have seen thier faces. They do not know where their children are and it is likely that they never will. Mass graves have been found but many were thrown into the sea, never to be recovered. The common perception when I was there was that the Catholic Church was in support of the military government during this horrible time. Naturally, the thought that this might be true has made me very sad. I have been holding out hope that there was more to the story than I had originally heard. Enter Bergoglio's Report. This book is written by a journalist and definitely reads that way. He has does good research and gives an accurate report of the political time. However, this reporter focuses in on the Catholic Church. There is good news in this book. It turns out that the bishops of Argentina publicly denounced the actions of the military dictatorship. In addition, brave Jesuits, like Pope Francis, saved people from the military government. This book collects the stories of some of the people that he saved. He did the work of Christ, quietly and successfully in an almost impossible situation! 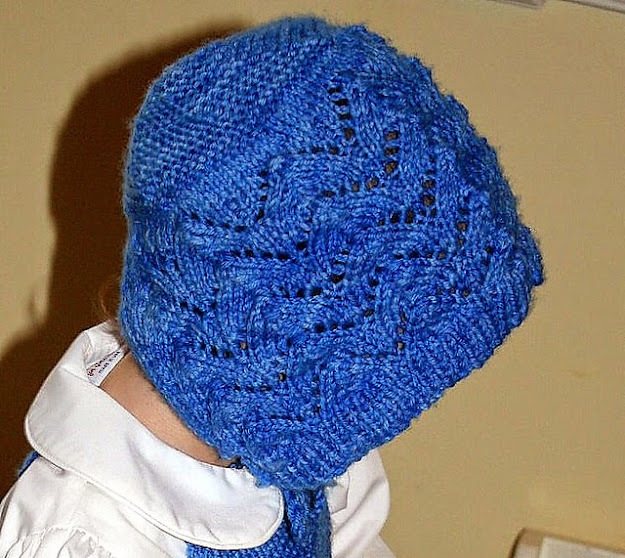 As for knitting, I finished a cable hat for myself. I finally managed to make myself a hat that fits both when my hair is up and down and doesn't pop off of my head constantly. Victory! This was a really fun reading year! I read a lot and most of it was really good. I read most of what I set out to but skipped and added a bunch. I also got some opportunity to write about what I read, which was excellent. I blogged about her and the first five books on the list at Carrots for Michaelmas). My Mortal Enemy - A powerful faith and end of life story here. It is short and very worth the read! O Pioneers (re-read) - Another beautiful prairie novel. This one is darker than My Antonia and fairly heavy on justice, as opposed to mercy. It deals with the children of pioneers, how they think, how they turn out, and the conflicts that they have. The Song of the Lark - The third in the "prairie trilogy" (along with My Antonia and O Pioneers), and definitely the weakest one. I found the heroine shallow and self absorbed throughout. A well written book but the moral compass wasn't quite right and the characters not as compelling. The Professor's House - I found this book to be endearing. I love the professor and how he is attached to his old study, but I would. I also enjoyed the story within the novel very much. A lot of heart aching beauty and finding purpose in life. Alexander's Bridge - This one was not very interesting but it is so well written that it I enjoyed reading it. This was one of her early novels, before she found the subjects that she wrote best on. So while her skill as a writer shows, the novel does not shine. A Lost Lady - This one was definitely tragic. It pictured the best of a time and its decline. The moral degradation of a beautiful character seemed to stand for the degradation of society and culture at the time. Lucy Gayheart - Another sad but good book though not one of Cather's best. It sends a strong message about the forgiveness and the importance of not giving one's heart away imprudently. April Twilights - This is a collection of beautiful American Poetry. Her writing style is so well suited to these poems, they are breath taking! North and South, a few times - I absolutely love this book! The love story is just beautiful and it is set in a time full of fascinating social issues. She does an excellent job of showing the changes that the industrial revolution brought to British society and the interaction between the classes. There is a constant striving to see the human person through all of the machinery and power struggles. Ruth - This book deals with falling into sin and seeking redemption. As a Catholic, I do not agree with every message in it, but I had much fruitful reflection from reading it. It was an important reminder of how easy it is to fall into sin, how important it is to seek redemption, and how important it is to be forgive. Sylvia's Lovers - This book is hard to describe without totally spoiling it. It deals with love, foolishness, and marriage. It is a rather dark book and I wondered many times where exactly it would end up. But marriage wins in the end and I am glad that I read it. It was an interesting historical and character study to boot. Cranford - I have to be honest, I thought that this book was boring. It is well written and some of the characters very charming but it just kind of fell flat. Wives and Daughters - I kept thinking that I did not like this novel only to find myself really invested in what happened in it. The characters grew on me and I loved them by the end! Another thought provoking book about love and marriage. The first few times that I read Jane Austen's novels, I was so caught up in the plot and romance that I didn't notice just how funny they are! I laughed and laughed this time around! Emma, twice - My favorite! See why here. 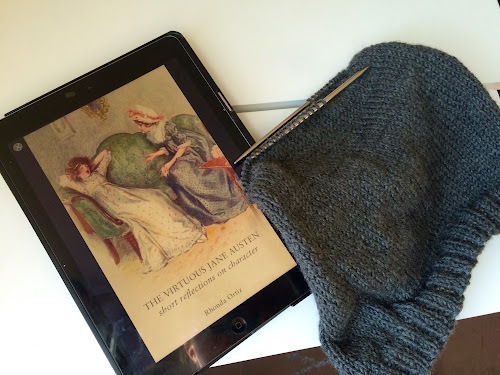 Northanger Abbey, twice - This little novel is climbing in my affections. I love Katherine's heart and Henry is such a lovable hero! Pride and Prejudice - I don't think I have original praise to give here. It's just amazing. Sense and Sensibility - I appreciate this one much more than I used to. I think I finally understand Elinor a little bit better and has helped me to appreciate the story. Short Stories by Flannery O'Connor: Parker's Back, Everything that Rises Must Converge, The Lame Shall Enter First - Though I loved all three, I found The Lame Shall Enter First to be the most thought provoking. It was jarring, relevant, and twisted in all of the right ways to provoke fruitful thought. Priestblock 25487 by Bernard Jean - Excellent, inspiring, heart rending book about a priest in a concentration camp. Totally worth crying through to see the heroism and love of Christ in this book. Mr. Blue by Myles Connolly - I loved this book. It is about a man who imitates Christ in a very Franciscan way while remaining in the world. It is written by a Catholic film maker right at the beginning of the industry and sets out a vision for how that art can help the world. There is so much heart and beauty in this little book! The Joyful Beggar by Louis De Whol - A very pious book that does a great job of explaining what was going in in a very confusing historical time. But the writing was a bit heavy. I am glad that I read the book but I am not jumping to pick up another of his novels. Though the history was interesting, I also wished he had spent more time writing about St. Francis. Middlemarch by George Eliot - I am so glad that I finally read this. It was fascinating and, of course, very well done. But I found myself unconvinced of the ending. I just wasn't convinced that the hero at the end of the novel was actually so great and worth the heroine's affection. I was almost convinced by her but certainly not by him. Little Dorrit by Charles Dickens - I haven't read a Dickens novel since I was in 9th grade. I loved him then, and I love him now! This book was funny, heartfelt, and full of dynamite characters. It was true entertainment in the best sense! Love Among the Chickens by PG Woodhouse - This is the first Woodhouse novel that I have ever read. I picked it because it looked funny. It was, delightfully so. Pick this one up if you need something lighthearted and well written! Shirley by Charlotte Bronte - I read this one right after Gaskell's North and South because I read that they are considered similar. I am glad that I read Shirley and enjoyed the comparison but I have to say that North & South is my favorite by far. The thing that really got me about Shirley was that she kind of drops the hero and heroine that she starts out with in favor of another half way through the novel. When she returned to the original hero and heroine to tie things up, it was hard for me to really believe the ending because I hadn't spent enough time with them and they had changed. I found the love stories in this one much less satisfying too. From what I can tell, Gaskell was a happily married woman and it shows in how she writes about love. Bronte writes love with some strange and slightly disturbing qualities, in my opinion. Green Dolphin Street by Elizabeth Goudge - I think that it was worth the read: enjoyable, thought provoking, and an interesting historical period. But I am not satisfied with it. I think she tried to make a good point about self-sacrificing love but missed the mark. I don't like deception and one of the main characters used it frequently. I didn't believe the ending as a result. I thought that the characters also did not give their hearts fully to their vocations, they gave their lives but not their whole heart and soul. Though it was good food for thought, I found the particular way in which that played out disturbing. A Handful of Dust by Evelyn Waugh - Well done and engaging satire. The only problem is that I just can't seem to find a book about marital infidelity funny. I understand why it is supposed to be funny but I don't find it at all funny. I'm looking forward to the discussion on this one at the book club that I belong to. Hopefully there is something that I'm missing! Here, There, and Everywhere by Dorothy Aldis - This is an old book of children's poetry that my kid's and I just adored. It is delightfully funny and well written and the vintage illustrations are so cute! Preparation for Total Consecration to the Blessed Virgin Mary - I read the original and loved it as well as the consecration. Belonging to Mary is sweet indeed! Guiding your Catholic Preschooler - Lots of good practical ideas in this one. 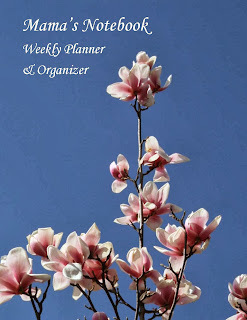 I found it encouraging with manageable projects and applicable advice. Feast! - I love the real food as well as the reflections on the liturgical year in here. It helped me settle into the liturgical seasons mentally as well as giving me great recipes for celebrations! The American Frugal Housewife - A charming book about how to keep house in the 1830s. I love homesteading stuff so this book was right up my alley! Good practical advice in here and a peek into how things were cooked so long ago. My sourdough is currently benefitting from her tips. Modern Essentials - Currently my favorite essential oils book. It is published by DoTerra and I don't buy from them but the information in here is very easy to access and apply. The Complete Book of Essential Oils & Aromatherapy by Valerie Ann Worwood - Some of the science in this book seemed a bit funny to me but I did get some good tips from it, especially on cheap and creative diffusing ideas. The Vegetable Gardener's Bible by Edward Smith - I am currently somewhat obsessed with planning a garden for next year and I adore this book. Natural, common sense methods meet beauty and order. The scientist and artist in me both love it! American Needlework by Rose Wilder Lane - This is a wonderful book with great instructions on how to do many kinds of needlework. There are diagrams and it is written clearly. 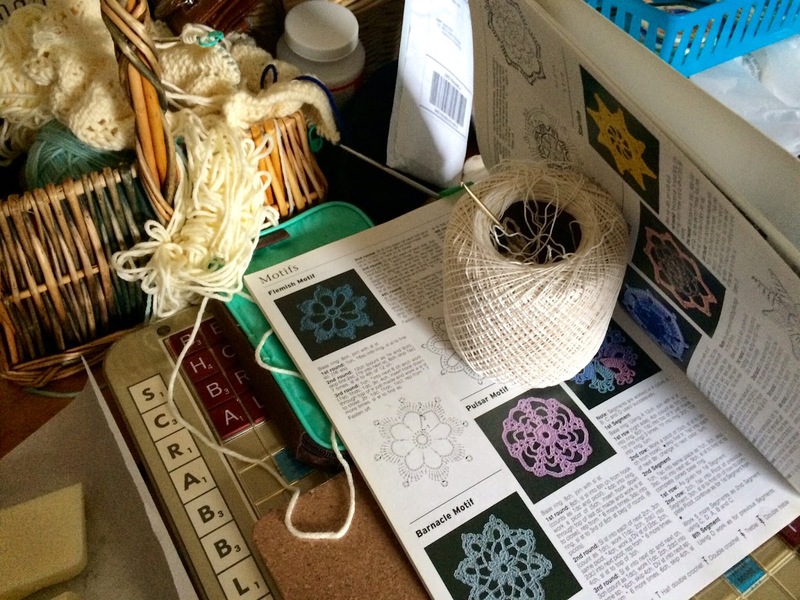 It's so neat that it is written by Laura Ingalls Wilder's Daughter too, There is a history of each kind of needlework. I have to be honest, I didn't read all of that and I don't know if it is well done from a historical perspective, but this book is worth it just for the needlework instructions and great illustrations. The Story of a Family - The story of St. Therese's family. My husband and I are doing this as a read aloud and it is excellent. We just keep getting interrupted. Hopefully this will be the year that we finish it! The Little Oratory by Leila Marie Lawler - I love every bit of this book and I cannot wait to finish it! Auntie Leila is just so wise and creative. The Rule of St Benedict (re-read)- This has always been powerful for me. It isn't just for religious either, I learn a lot from it as a married woman. 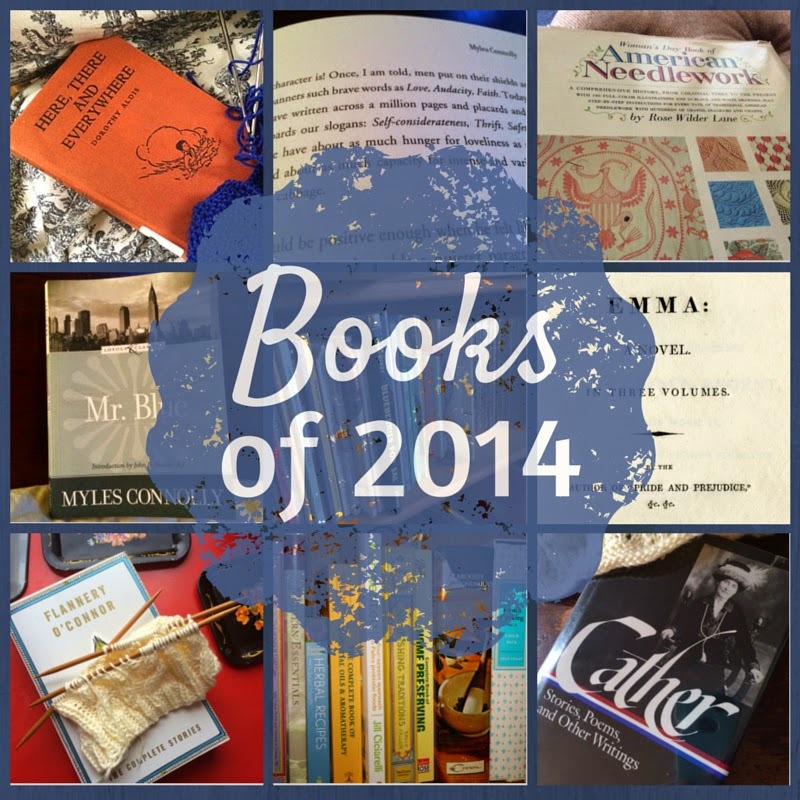 I'd love to hear about your favorites of 2014! 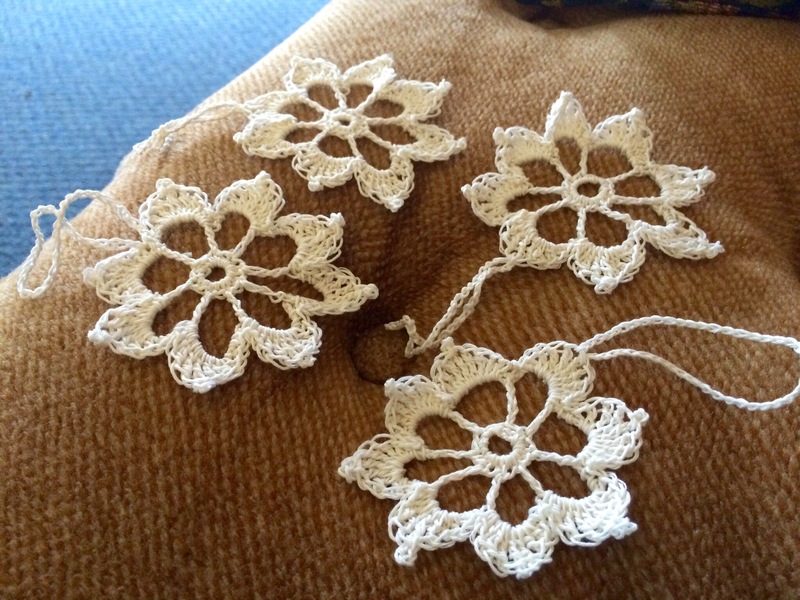 I have started to crochet my annual snowflake. I make some for our tree every year and we all love the little tradition that it has become. I picked a floral motif this year (each year is different). It only has three rounds but it is difficult to keep even. I have had to really pay attention to my gauge and am learning a lot despite the simplicity of the pattern! I finished Green Dolphin Street by Elizabeth Goudge. I think that it was worth the read: enjoyable, thought provoking, and an interesting historical period. But I am not satisfied with it. I think she tried to make a good point about self-sacrificing love but missed the mark. I don't like deception and one of the main characters used it frequently. I didn't believe the ending as a result. I thought that the characters also did not give their hearts fully to their vocations, they gave their lives but not their whole selves. Though it was good food for thought, I found the particular way in which that played out disturbing. I'd say that the book was "ok."
I'm still juggling around what to read next. My book club is reading Evelyn Waugh this month and I am very excited about it! The question right now is whether or not to sneak in a Jane Austen first. My needles have been busy these last few weeks knitting for sweet little baby boys that are cropping up in our family. 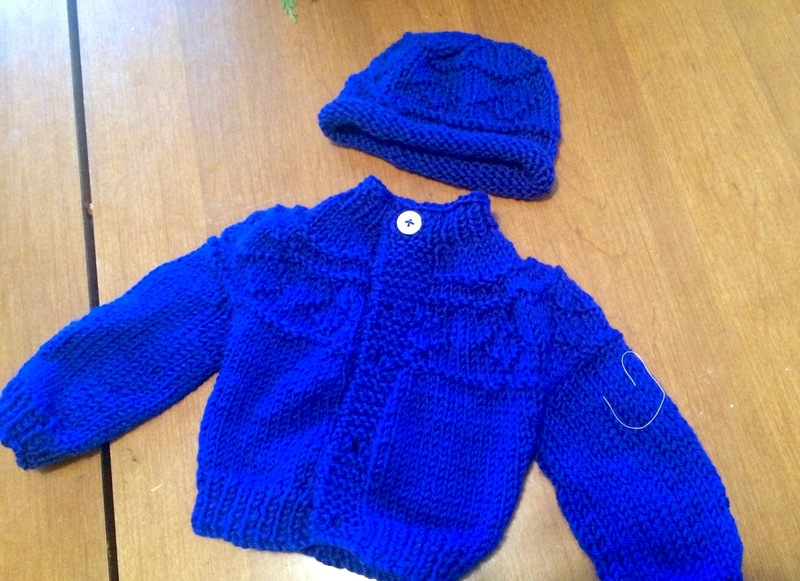 The first sweater and bonnet are three month size. My husband picked out the buttons and I just adore them! The second sweater and hat is a premie set. It came out well but I don't know if I would use the pattern again. It had no provision for armpits and the yoke was a little bunched. I made my first dishcloth this week. It was fun to get something done so quickly and the cloth actually worked really well for cleaning my dishes. I had never tried one before and I am so impressed! More are on the way. 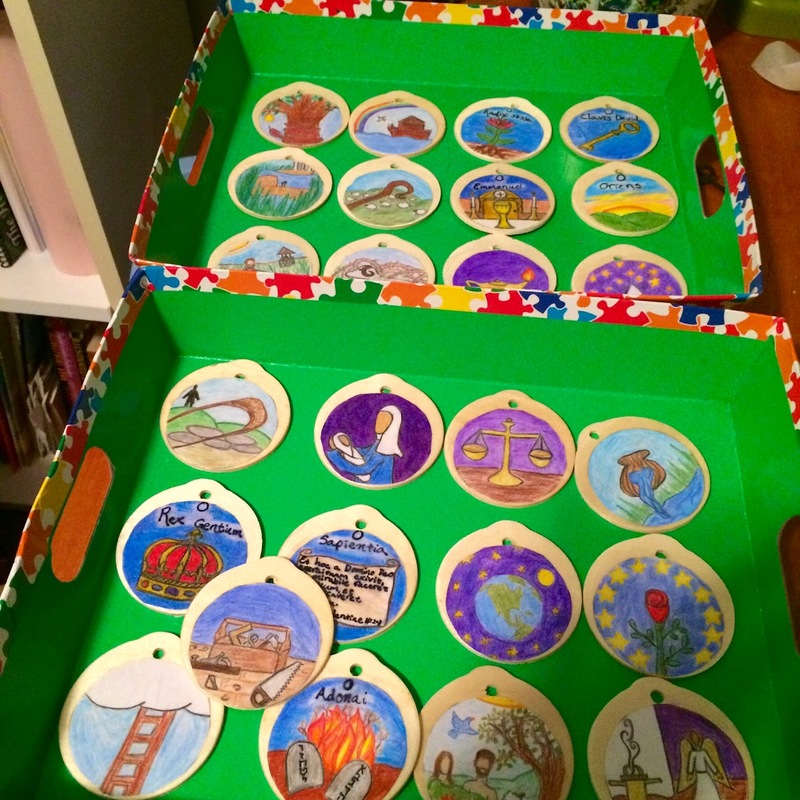 The Jesse Tree came together in time and the children and I are really enjoying going through salvation history together. I'm using the Fr. Lovasick Children's Bible and I really appreciate how he has a little paragraph tying each old testament story back to the coming of Christ. It is perfect for the Jesse Tree! I finished the Dickens novel that I have been reading, Little Dorrit, and I loved it. His characters are so wonderful and funny but not in a goofy way. Reading a Dickens novel is truly enjoyable for me. THey are history, virtue, and good literature all in one package! I am now on to reading Green Dolphin Street by Elizabeth Goudge, not to be confused with another novel of similar title, On Green Dolphin Street. Green Dolphin Street is a complex love story and deals heavily with beliefs about eternal life. There are a lot of characters vying for first place with their theories and my opinion of the novel will depend heavily on who wins. I will find out in 150 pages! Though I have found the story compelling thus far, I am not a huge fan of her style. It seems to me that she goes just a little bit too long in her descriptions and has too many breaks and sub-sections. While that is a bit trying, it doesn't outweigh the fact that she actually does write good descriptions and characters. So far it has been worth the read.